as it appeared in the February 2000 issue of Womens Biz Resources. Having used the WMEE since 1998, I've seen it just get better and better. Along with the CD-ROM you get the 1,112 page softcover book, which makes this a surprisingly nice package. I'm of the "old school" where holding a book in my hands still means more to me than reading one on the screen. However, in this case, using both goes a long way. You may wonder why WMEE would be a benefit to any business - well, here's why: Although WMEE was originally designed for writers to look for agents, publishers, publications and more, this is the ideal tool for the small business. With it you can learn the best places to send your press releases to, keep track of them and more. So, let's take a look at WMEE 2000. In this case, depending on which audience you want to reach with your press release. 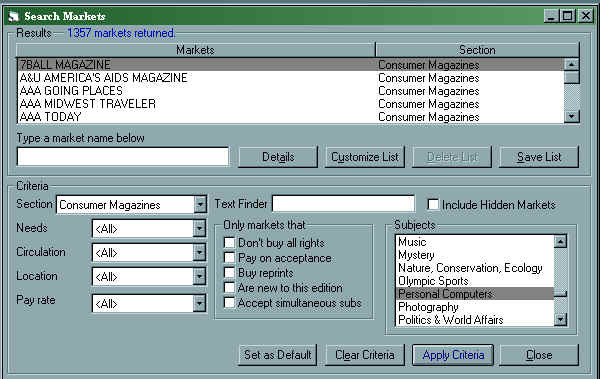 We'll select Trade Magazines for this example, leave NEEDS on ALL, CIRCULATION and PAY RATE and select U.S. (ENTIRE). Under SUBJECTS, we'll look for what fits our business, which for this example is a start-up computer company, then click on APPLY CRITERIA. This brings up a list of appropriate magazines. Let's say we're getting ready to introduce a new software program that will make surfing online easier. We'll take a look at COMPUTER CURRENTS first, selecting it, then clicking on DETAILS. Here you can find out more about the publication, from its address/phone info to web site URL (if there is one) and editorial profile to make sure your product will fit its content. Don't be scared by the info there strictly for writers. You need to see what columns they have and what kind of articles they are looking for. Then you can decide if your press release will fit this publication. You never know - the editor may like your product so much they just may want to write an article about it, so the better you target your press release, the more publicity you'll get. You can use the SUBMISSION TRACKER to keep track of where and when you send a press release out, then see who publishes it and who doesn't. If you find one publication tends to publish your press releases more often than not, you may want to approach them about freelancing an article about surfing online, or whatever your expertise is - you never know, they just may say yes. Just remember to offer an article that is about your business in general, not *about* your business. There's also a lot more. Under the "HELP" pull-down menu on the toolbar are several other great things you can read and take advantage of. 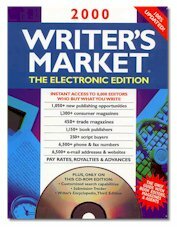 The one thing I don't like about this year's version is that it's missing a lot of the interviews and tips in the CD-ROM edition that previous versions had in both the CD-ROM and book. This year, all the "extras" are only in the book, but worth a read, as it can give you tips on writing a more effective press release. 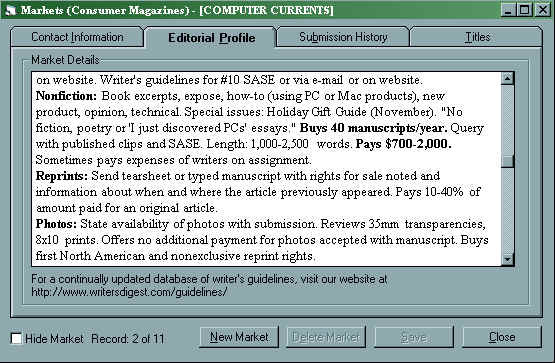 On the plus side, it's not only is it more Windows-friendly this year, it's search functions are much more flexible, you can easily import or export market information to other applications (such as a word processor), you can create and manage custom market lists and it has much more information than the 1999 edition - with over 8,800 completely updated listings, including 1,050+ new ones. So what are you waiting for? Go out, buy this and get your press releases out today!